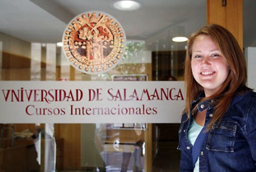 The Integrated Studies Program offers foreign students with a high level of proficiency in Spanish unique opportunities to register for a wide variety of courses offered throughout the various Universidad de Salamanca degree programs. They can register for a minimum of two and a maximum of six subjects per semester. Attend classes, alongside Spanish students registered in these courses. The program price will depend on the number of credit hours of each course. *** With regard to the Grado courses, already adapted to the European Credit Transfer System, their fee is consistent with the new measurement of academic burden of these courses within the adaptation process of the European Higher Education Area: 1 ECTS is equivalent to 25 or 30 class hours (presential classes with a professor and pupil’s individual work). Students who want to cancel their registration will have to communicate it in writing. Furthermore, they will have to submit the original document Cursos Internacionales gave them to prove they had been registered.